This corn is not anemic – it is white corn, so fresh and sweet, you may forego dessert! Happy 4th of July! 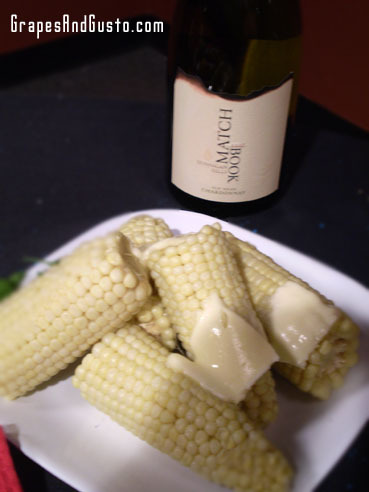 For your next backyard picnic, let’s put together a classic complementary pairing: Chardonnay and, yes, corn on the cob (don’t forget the butter). It’s not that the corn and the Chardonnay themselves are a classic pair, specifically, but the idea that a moderately or highly oaked Chardonnay is paired with a buttery dish makes for a harmonious match in the mouth. The sweetness and butter of the corn targets the toasty, buttery, sometimes vanilla-like that oak aging often lends to Chardonnay – the wine “chameleon” – so that similar elements in the food and wine are keenly matched, like a frilly bedroom set. Try this with buttered popcorn, too, and you’ll see this principle once more. This post is part of a “Picnic Pairings” series, which starts here. Good examples: Matchbook Chardonnay 2007 (California, $18); A to Z Chardonnay (Oregon, $17); Value pick: Jacob’s Creek Chardonnay 2007 (Australia, $9).